With the eTrex Legend, Garmin has loaded a full base map of North and South America into one small unit. The Legend is also designed to provide precise GPS positioning using correction data obtained from the Wide Area Augmentation System (WAAS). This product will provide position accuracy to less than three meters when receiving WAAS corrections. The base map contains lakes, rivers, cities, interstates, national and state highways, railroads and coastlines. The eTrex Legend is also equipped with additional memory totaling eight megabytes. 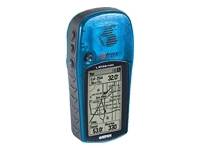 The added memory allows the eTrex Legend to accept downloaded map data from Garmin's entire line of MapSource CD-ROMs, including Fishing Hot Spots. The eTrex Legend comes in a brightly colored translucent blue case that really makes the unit stand out. New to the product design, Garmin will include marine aids to navigation in addition to the base map. These navigational aids will be pre-loaded into each unit from the factory. It is compatible with most Garmin MapSource products including MapSource BlueChart marine cartography, MetroGuide, and Fishing Hot Spots. Accepts up to 8 megabytes of downloaded map detail.